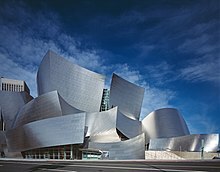 The Walt Disney Concert Hall is a concert hall in Los Angeles, California. It is the home of the Los Angeles Philharmonic orchestra. It seats 2,265 people. The building opened in 2003. It was designed by Frank Gehry. The acoustics of the hall are very good. The hall has a very large pipe organ which was completed in 2004. It was built by the German organ builder, Caspar Glatter-Götz. It has 6,125 pipes. ↑ "Rosales Organ Builders, Opus 24 (Walt Disney Concert Hall)". Retrieved January 3, 2008. This page was last changed on 13 August 2018, at 18:42.